I've bought a disk with Super Boulder Dash in the USA. The problem is that the game won't load. Side 1 contains BD1 and side 2 contains BD2. If I try to load them, it all seems going well until the EA logo appears. At this point it keeps loading but doesn't start. I sent the disk back to the USA and received another one, but exactly the same problem. What can it be? USA, Europe, or NTSC, PAL? Just a thought... EA had a pretty complex copy protection scheme / fast loading utility (it's what's going on when the EA logo is flashing) and I had a few EA games stop during the load utility when the disk became corrupted. That's all I can think of at the moment. Super Boulder Dash from EA and the box seen above are what introduced me to Boulder Dash. Both sides worked for me in the USA on my Commodore 128 (in 64 mode). When I loaded it up and started playing the first cave, I fell in love instantly. I had always gone straight to the Dig Dug machines in the arcade and this game blew that out of the water. The game itself is the unaltered NTSC version on any release, including those sold in PAL countries, thus the non working intermission in BD1. The problem could well be a custom loader or a copyprotection depending on an NTSC C64. I don't know if the disk is encrypted (which is the case with more advanced copy protection schemes.) If not, you should be able to just load the game instead of the loader and start it with a sys command. Ruben sent me a .d64 file of side 1 of his disk. Anyway, the help was much apreciated! As I can remember EA had a copy protection on the disc. Something of a bad sector or somthing like that? Can't remember exactely. I remember exactely that I found a site on the net with information about this disk. It's a site about backuping old C64 games - but you can not download anything there. I try to find it again! Super Boulder Dash is also in the data base. The Microfun and First Star releases are very primitive, as they are merely checking for a missing sector. I never saw an original copy of Super Boulder Dash, as it apparently is NTSC only, they wouldn't sell it in Europe anyways. The database has listed pirateslayer there which requires a parallel nibbler to copy. Yes, this was the site! I think it must be a bad dump. Maybe you can describe exactely how to dump the disk? Or is there any documentation? 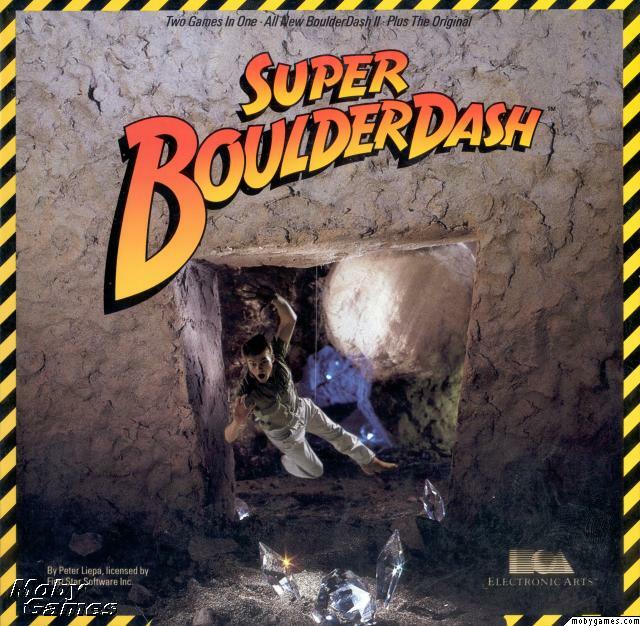 It would simply be great to have a working backup of the original Super Boulder Dash collection! I think it must be a bad dump. Maybe you can describe exactely how to dump the disk? I have no experience with that protection. I don't think that it's a bad dump as it works in NTSC mode, eventhough the loader accesses track 37, which is not present in the image. It might well be that Super Boulder Dash was meant for NTSC regions only. In fact, I never saw it officially sold to Europe. I took a further look into that image. The game itself is a regular file, except that it doesn't appear in the directory. Its start position is track 1 sector 1 and it is 65 blocks long. It is not compressed, but encrypted by simply exor all bytes (including the start address) with 0xEA.